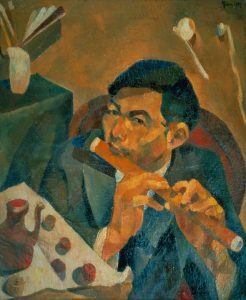 A remarkable self-portrait, an oil painting called The Flute Player by Yun Gee, is an even more self-conscious expression of eclecticism and daring. Gee was born in 1906 in Kaiping County, Guangdong (he died in 1963), and arrived illegally in San Francisco in 1921. He settled in Chinatown and almost immediately began to study the Parisian style of easel painting at the California School of Fine Arts. We see the school’s effects in The Flute Player, where the facets and edges, the upright planes, the choppy strokes, and simple studio still lifes so typical of Salon Cubism are everywhere in evidence. Gee called his paintings “revolutionary” and intended that to describe the style but also to carry a social and political charge, in keeping with his founding in 1926 of a Revolutionary Artists’ Club. That club, comprising young Chinese men living in San Francisco, attempted to link radical artistic from with a new nationalist sensibility and expressiveness among the Chinese. 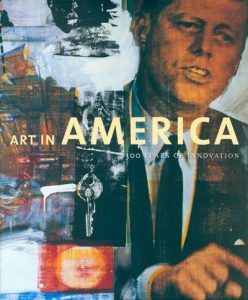 Importantly, Gee also helped to found the Modern Gallery, an avant-garde collective whose goal was to introduce the latest Modernist painting in Europe and America to the Bay Area. In all these ambitions, Gee was not rejecting his Chinese past but attempting to incorporate it in a pan-Modernist world. In the self-portrait, he plays a Chinese flute, offering a song to himself and, like the musician-painter in fig. 92 [above], harmonizing the potentially disparate elements – the porcelain teapot, the brushes and fans, the hard Parisian style – and acclaiming them as constituent of himself.